Hunger-related illness is the leading cause of death in children under the age of 5. In fact, 1 in 9 people in our world doesn’t have enough food to eat, meaning hundreds of millions of people will go to bed hungry tonight—and every night. This is a reality that local churches around the world are committed to changing. Hunger has a range of effects. Without nutrition, children's minds and bodies cannot develop properly. Malnutrition compounds the effects of diseases, including HIV and AIDS, malaria, and pneumonia. And it keeps people from fully engaging in productive work and income generation. While disasters and political conflicts contribute to food shortages in places like Syria, the main cause of hunger is extreme poverty. It’s a vicious cycle. Extreme poverty causes hunger, but then hunger keeps people stuck in the trap of poverty because people who are hungry are unable to fully engage in productive work, and they also get sick more often, which means higher costs related to medical care. In response, Nazarene Compassionate Ministries child development centers provide meals and nutrition training for children and their families. Community or backyard gardens and sustainable agriculture programs help support children and families affected by disease and poverty. Food pantries nourish families and individuals in need. And emergency food relief meets people’s most basic needs when disaster strikes. By giving to the NCM Global Hunger Fund, you are providing food for those who are hungry and giving children a chance to grow up healthy. $25 USD will help provide emergency food assistance for a family in places like the Horn of Africa and the Sahel. 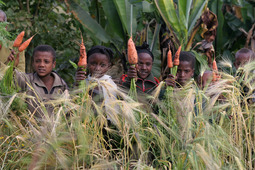 $50 USD will help provide seeds, tools, and training for gardens in places like Mozambique, Bangladesh, and Zambia. $100 USD will help provide a goat and chickens, along with training in how to care for them, for a family in places like Rwanda or Ghana. Be sure to put ACM1191 in the Memo area. Thanks for your donation.